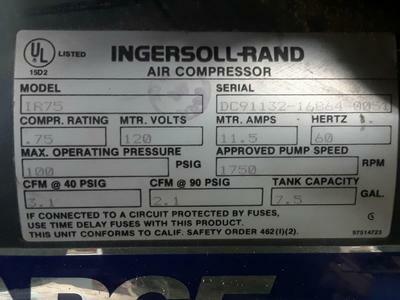 In attached you’ll find the pictures of the compressor and if you look at the upper left corner you’ll see the broken part..
I’m looking for the part to replace that. Ben, the part in the photo you have identified as failing can be replaced by any standard, general purpose, mini-regulator. With the compressor tank empty and the power off, remove the coupling shown to the left of the regulator, then remove the regulator itself. 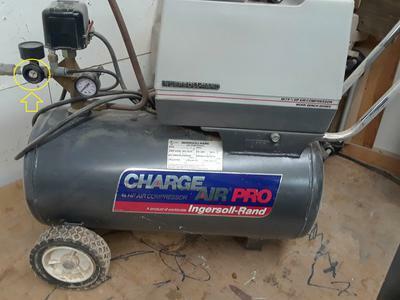 Take it to any big box or hardware store that sells air compressors, and most will sell replacement regulators. They are not that expensive. Have the old one with you to compare to the new to ensure that the ports (where the threads are) are the same on the new as the old.